Back in May, Withings co-founder Eric Carreel purchased the company back from Nokia. Just four months later it's launching its first post-Nokia product, the Withings Steel HR Sport, a more sporty version of its Steel HR flagship. This is a multisport hybrid smartwatch that pairs heart rate tracking with connected GPS and VO2 Max. But in terms of looks, it's near identical to the Steel HR. The same sub-dials are here, with a digital display up top to see data and an analog dial at the bottom showing your progress toward your activity goals. There are subtle tweaks, like red accents on the hour and minute hands and a new logo. It only comes in a single 40mm size (at 49g) and there's 5ATM water proofing. There's also a perforated sport band that'll breath better when you're working out. Earning the watch its title, there's support for 30 different activities, including yoga, volleyball, rowing, boxing, ice skiing and hockey. You'll be able to track optical heart rate during your workout and have it contribute to that VO2 Max score. The Steel HR Sport is also the first Steel HR hybrid to sport connected GPS, which uses your phone's GPS to help track pace, elevation, distance and maps. Once again there's really good battery life, with 25 days promised for general use. You can also extend that 20 additional days when you use the power saving mode. Because of all that, you'll also be able to track your sleep, detecting length and quality of sleep and giving you a sleep score in the companion Health Mate app. There's also notification support. 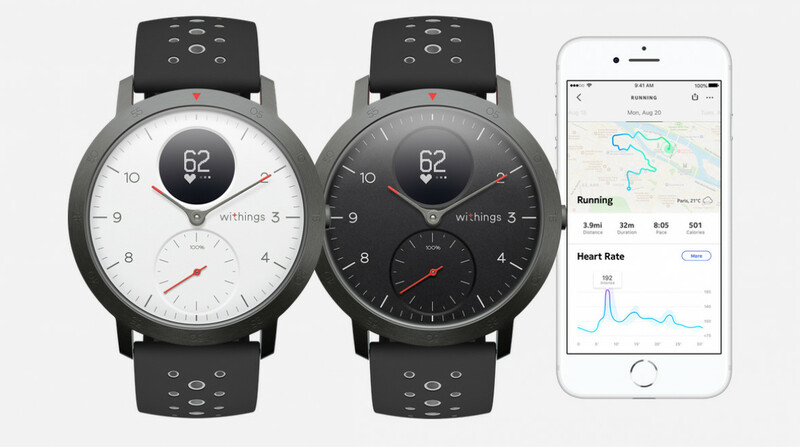 The Steel HR Sport is available today for $199.95 on Withings' website and Amazon. It's available with either a white and black watch face. The default band is a grey silicone sport band, but additional options are available - including a red silicone and a leather.